I have heard it said that sometimes you have to hit rock bottom before you realize a need. This is indeed the case for many people who are ignoring the call to accept Jesus as Savior. Though it is not always true, I have seen people go through life as a Prodigal — someone who has no regard for how to be careful with money and resources. The Prodigal is wasteful, reckless, imprudent and quite frankly, a spendthrift. In the same way, they live their life for themselves with no regard for the needs of others. They party hard and choose to spend time and money on ungodly habits and activities. The good news is that the Prodigal can be redeemed and when that happens, we can be witness to an absolute miracle. We see a person who in our human mind believed could and would never change brought up out of the miry clay onto the firm foundation that is found only in Jesus. The Redeemed begins to budget resources and make good life choices. They find true joy in Jesus, rather than in the things of this world. In Luke 15:11-24 we see the well-known parable of the Prodigal Son. Take a look at what I see as the comparison of the Prodigal and the Redeemed below. Notice that the Prodigal must sink all the way to the bottom (vs 16) before he can begin to come out of the pit back up to true joy (vs 17-24). Luke 15:12–13 And the younger of them said to his father, Father, give me the portion of goods that falleth to me. And he divided unto them his living. And not many days after the younger son gathered all together, and took his journey into a far country, and there wasted his substance with riotous living. Luke 15:20–21 And he arose, and came to his father. But when he was yet a great way off, his father saw him, and had compassion, and ran, and fell on his neck, and kissed him. And the son said unto him, Father, I have sinned against heaven, and in thy sight, and am no more worthy to be called thy son. Luke 15:23–24 And bring hither the fatted calf, and kill it; and let us eat, and be merry: For this my son was dead, and is alive again; he was lost, and is found. And they began to be merry. 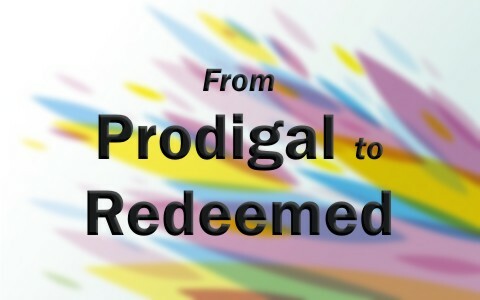 Have you ever had a time in your life where you have gone from Prodigal to Redeemed? If you have not made the decision to accept Jesus as your personal Savior, you can do it right now. Right there at your screen. Come to Jesus. He is waiting to give you all that you need to know true joy. Previous post: How Do You Approach A False Teacher?